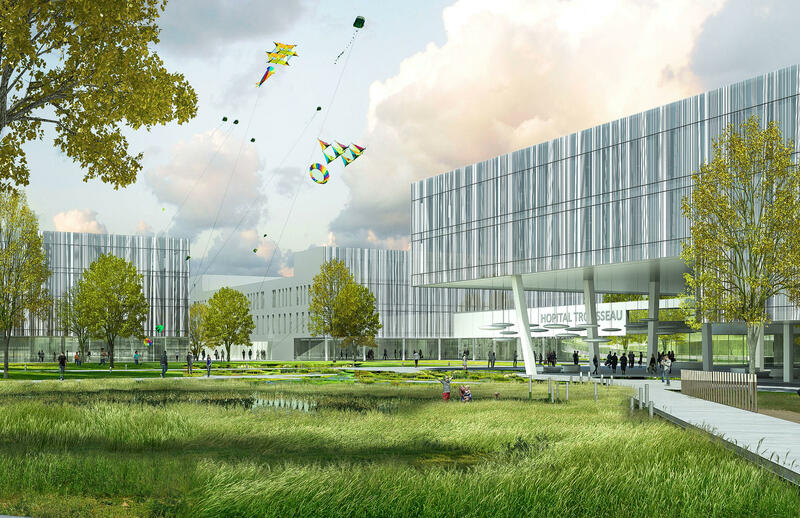 The University Hospital of Tours has redefined its care system and launched an international architecture competition with a long-term vision of major urban issues. This flagship project has been valued at € 320 million and features flexible engineering solutions developed by AIA Life Designers and TPF Ingénierie in order to build the hospital of tomorrow. An incarnation of modernity and ambition, the University Hospital of Tours project follows a high environmental quality approach and meets the challenges of digital architecture (BIM). It is part of a large real estate restructuring plan that will consolidate activities by 2024. These activities are currently spread over five locations and will be gathered on the two sites of Bretonneau and Trousseau. With a budget of 320 million euros, it is one of the largest hospitals in France after the University Hospital of Nantes. AIA Life Designers partnered with TPF Ingénierie and has been awarded the project at the end of 2017. On a technical level, the group presented an approach oriented towards new technological choices and a “full digital” approach. The University Hospital also appreciated the innovative and efficient energy strategy, particularly through the recovery of lost energy. The new Trousseau Hospital will be completed in 2024, with works commencing mid-2021.